Arqaam Capital is a specialist investment bank focused on intermediating global capital allocated for investment into emerging and frontier markets. The fundamental corner stone of our business is award winning research and today we provide deep insight in over 300 listed corporations across the Middle East and Africa. This research is our IP and underpins the business verticals which we have built over the last ten years into best in class products and services including sales and trading, asset management, investment banking and alternative investments. How long has Arqaam Capital been investing in tech, and why have you chosen to focus on tech investing? Arqaam has always invested in technology. From the onset of our business in 2007, Arqaam made a conscious decision to leverage technology to differentiate ourselves from competitors. Arqaam invested heavily in transactional and operational technology to ensure our commercial architecture is world class. So as our business grew and we began to deploy proprietary capital into privately owned companies, targeting tech sponsors has been a natural progression for us. What potential do you see in tech investing? Investing in tech is not an option but a necessity. We are moving towards a rapidly digitized environment which has influenced the way we interact with our families or work colleagues, to how we purchase goods and services or manage our personal finances; tech is the common denominator. Therefore, from an investors perspective, the substantial success of leading tech companies globally is proof of concept that investment portfolios should have an allocation towards tech. 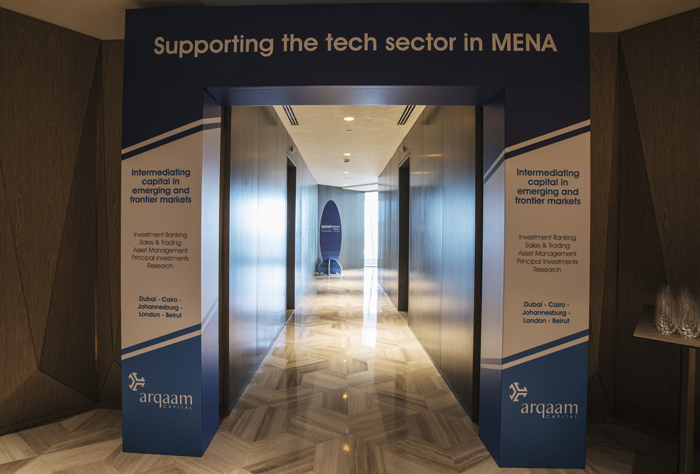 From Arqaam’s perspective, financial technology is disrupting our industry globally and in order to remain relevant over the coming years, we have to invest in emerging tech which provides us with commercial advantages whether it be in online transactional payments, data analytics, settlements, regulatory tech and so forth. What potential do you see in MENA tech specifically? MENA tech has exciting fundamental growth drivers: medium to high disposable incomes, rapidly growing internet and smart phone penetration, improving government policy and adoption of tech and supported by an expanding population of 450 million, a large percentage of which is below the age of 25 and tech friendly. Which verticals or industries are you most excited about? As a financial services firm we are more interested in financial technologies which can either disrupt and reinvent our business model or lead to the creation of new business verticals. Some areas of interest are mobile transactional payment services, online lending, credit scoring through artificial intelligence and blockchain for smart contracts and streamlining the clearing and settlement of securities. What are the main criteria you look at when considering an investment in a tech startup?